Larry Hull doesn’t get too excited by phone calls from Comal County residents demanding that he do something to protect groundwater from development in rural areas. His mandate, as president of Comal Trinity Groundwater Conservation District (CTGCD), is to help Comal County residents conserve, preserve, recharge, protect and prevent waste of groundwater from the Trinity Aquifer, which underlies all of Comal County. His more immediate responsibility, and that of six board members appointed by Comal County Commissioners Court, is to reduce the opportunity for contamination and to keep water produced from different formations or levels within the Trinity Aquifer Group from intermingling with each other. In Texas, the preferred method of managing groundwater is through groundwater districts. The Texas legislature passed the Texas Groundwater Management Area Process in 2005, setting the framework for regional collaboration between local groundwater conservation district managers with shared aquifers. The district first began with the development of a management plan, which required submission to the Texas Water Development board within three years of its formation. The plan was submitted and approved in 2018. In January, CTGCD began implementing rules that strengthen the county’s well-construction standards, requiring that new wells drilled into the Trinity Aquifer — with the exception of public water supply systems — be sealed by concrete at a minimum from 100 feet from the surface and 100 feet above the water-bearing formation. The district also established rules regarding separation requirements from adjacent properties, other wells and septic systems in order to decrease the Trinity Aquifer’s risk of contamination from other sources. Hull said Comal landowners can even discuss stricter options with well-drilling companies as part of the bid process. The fee for registering a new exempt, or well producing less than 25,000 gallons of water per day, is $400. CTGCD’s funding derives from a fee of $20 per-acre foot from non-exempt wells. An acre-foot is 325,851 gallons, which equates to .0006138 cents per gallon. The agency’s authority to control the quantity of water pumped was restricted by legislation by grandfathering commercial wells drilled prior to the summer of 2015. The legislation also prohibits requiring meters to be placed on residential wells. In addition, the district is restricted from imposing any ad valorem tax. H.L. Saur, general manager, oversees the application and permitting process and the construction of new wells. He worked in the water-well service industry for over 42 years and is familiar with the Trinity Aquifer in Comal County, as well as water-well construction methods and standards. In most cases, he inspects wells while they’re still under construction to ensure compliance with new rules and well-construction standards. Hull and other members of CTGCD’s board of directors are not paid for their service. Jensie Madden represents Canyon Lake’s Precinct 4. What Makes the Trinity Aquifer Unique? In Comal County, it’s hard for drivers to miss signs along area roadways announcing when they’re entering and leaving the Edwards Aquifer recharge zone. That’s because the Edwards is a karst aquifer that recharges or fills with water quickly after it rains. Experts know exactly where it tops off. The Trinity Aquifer, which underlies all of Comal County but extends under the Edwards near New Braunfels (see map at the bottom of this article), is different. It’s a limestone aquifer that refills so slowly that some water wells drilled into it produce only two to three gallons per minute, although rates are sometimes higher in the southeast part of the county. Hull said only four to five percent of all rainfall ever reaches the lower levels of the Trinity Aquifer. He said he often gets questions from people who confuse the “Trinity” with its various formations. 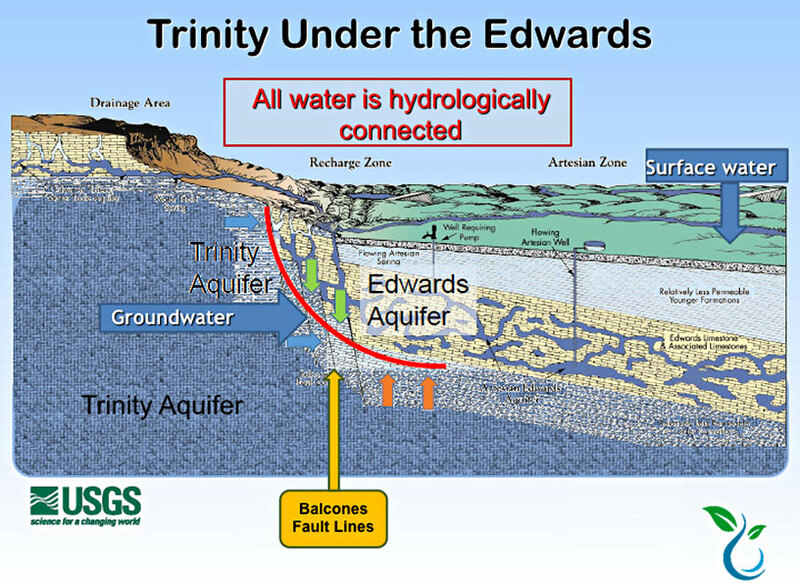 The Trinity Aquifer Group is composed of several smaller aquifers contained within the Trinity Group. Although referred to differently in different parts of the state, they include the Antlers, Glen Rose, Paluxy, Twin Mountains, Travis Peak, Hensell, and Houston aquifers. These aquifers consist of limestones, sands, clays, gravels, and conglomerates. Their combined freshwater saturated thickness averages about 600 feet in North Texas and about 1,900 feet in Central Texas. Texas Water Development Board explains: “The Trinity Aquifer extends in a band through the central part of the state from the Red River to the eastern edge of Bandera and Medina counties. The Trinity-Edwards Plateau Aquifer covers all or part of over 20 counties from Gillespie to the trans-Pecos region of west Texas. Together, they are the primary water source for most of the Hill Country. Most users in northern Bexar, Bandera, Kendall, Comal, and Kerr counties get their water from the Trinity. “At the same time, all of Bandera, most of Kerr and Kendall, and large parts of Comal and Bexar counties serve as drainage or catchment area for the Edwards Aquifer. Who Owns Comal County’s Groundwater? Landowners in Texas own water that emerges from the ground, along with groundwater beneath their property. This ‘Rule of Capture’ is one of the reasons why CTGCD cannot restrict water usage by developers. Canyon Lake is considered surface water, which owned by the state. Hull said all groundwater is governed by the ‘Rule of Capture,’ which gives landowners the right to pump as much water as they wish even if doing so may deplete water in neighboring wells. The law may favor landowners but on its website CTGCD said it is “feverishly” working to protect the Trinity Aquifer in the face of rapid development in Comal County, now the second-fastest growing county in the United States. Hull said the GTGCD is very focused on educational outreach that promotes a variety of conservation practices. CTGCD favors a holistic approach that makes every drop count. Hull believes Comal County residents are all in this together, and that all water users should understand the importance of careful and responsible use of precious groundwater. The district also is focused on gathering scientific data on the complex aquifer and has begun charting and mapping its reservoirs. Devices have been placed on selected wells to measure levels and changes in the levels of the Trinity. In the future, CTGCD plans to publish this data. Since January, property owners have filed for 32 permits and applications to drill new wells, a statistic that surprised even the CTGCD. In the mid-1990s, a couple of “old guys” in their seventies asked him to serve on the newly minted City of Bulverde’s planning-and-zoning commission. Now Hull is the new “old guy” in his seventies and Comal County residents are demanding answers to the same questions. Sometimes he tells them he understands why they’re upset — because Comal residents were just as concerned by his arrival. He may be retired after 32 years of service with AT&T, but the Vietnam War veteran is a licensed pilot who still avidly scuba dives, sails, farms and ranches, and lives on the family ranch surrounded by family and grandchildren. He loves the water resources that make Comal County unique, observing daily the rise and fall of Guadalupe River levels in front of his homestead. Hull was appointed to his current position by Comal County Commissioners Court in 2015. He’s president of the Guadalupe River Association and past president of Comal County Emergency Services District No. 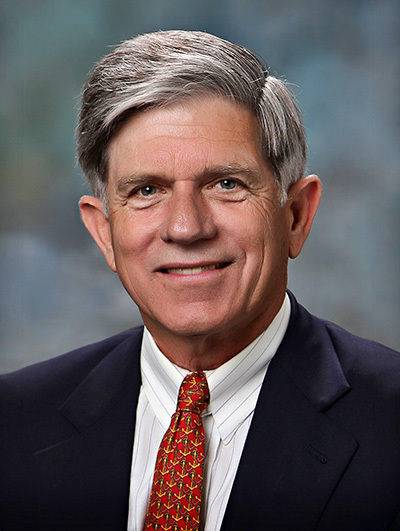 4, former secretary of Bulverde-Spring Branch Emergency Services Council, former board of director for the State Association of Fire and Emergency Services Districts, and past treasurer of Comal County Child Welfare Board. Perhaps because he’s seen it all, he describes himself as a fact-based person who’s not easily swayed by “suppositions” and theoreticals about water usage. Nobody really knows how much water really exists in the Trinity Aquifer, he said, but long-term concerns are warranted until more is known about the Trinity Aquifer in Comal County. Hull prefers to focus on what he and other residents can control. When he turned on his property’s sprinkler system for the first time years ago, it was also his last time as he watched the level of water rapidly go down in the storage tank and realized the folly of wasting water on grass and shrubs never intended for the rugged Texas Hill Country. Hull believes others will do the same. Nobody wants to see the Trinity Aquifer get depleted, including Vulcan Materials, suppliers of aggregate to the construction of homes and subdivisions, and especially not owners of private wells. Canyon Lake to a certain extent buffers residents from cyclical droughts, he said. However, conservation efforts notwithstanding, plans are underway to begin piping water in from Bexar County into western Comal County, where three new subdivisions, including Honey Creek, are under development in areas the Trinity cannot fully support. Which brings Hull back to the concerns of the older men and women who created the City of Bulverde. Someday he’ll be gone, too, and it will be up to younger arrivals to carry the torch forward to new generations. Hull views his current assignment as a labor of love. To learn more about CTGCD, click here.